Despite trillions of dollars in Western aid, 2.8 billion people worldwide still struggle in abject poverty. Yet the world’s richest countries continue to send money—mostly to governments—targeting the symptoms, rather than the root causes of poverty. We need a better solution. 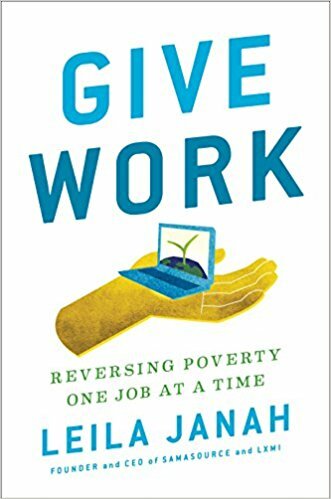 In Give Work, Leila Janah offers a much-needed solution to solving poverty: incentivize everyone from entrepreneurs to big companies to give dignified, steady, fair-wage work to low-income people. Her social business, Samasource, connects people living below the poverty line—on roughly $2 a day—to digital work for major tech companies. To date, the organization has provided over $10 million in direct income to tens of thousands of people the world had written off, dramatically altering the trajectory of entire communities for the better. Janah and her team go into the world’s poorest regions—from refugee camps in Kenya to the Mississippi Delta in Arkansas—and train people to do digital work for companies like Google, Walmart, and Microsoft. Janah has tested various Give Work business models in all corners of the world. She shares poignant stories of people who have benefited from Samasource’s work, where and why it hasn’t worked, and offers a blueprint to fight poverty with an evidence-based, economically sustainable model. We can end extreme poverty in our lifetimes. Give work, and you give the poorest people on the planet a chance at happiness. Give work, and you give people the freedom to choose how to develop their own communities. Give work, and you create infinite possibilities.